The moustache on 1-6-05. Notice the neatly trimmed area above the mouth and beneath the nose. It's like a pencil thin meets Dali. The overall effect is rather whispy. Facial hair is fun. Historically it has been one of the ways men could accessorize, style, and primp without being labeled effeminate. And -- with the exclusion of that rare and special breed of hirsute ladies -- what could be manlier than prodigious facial hair? But the lone moustache has been given a bad rap. I first started playing around with the lone moustache (i.e. no beard, no “hip” goatee, just a moustache please) in 1999. At the time, it would have been cooler to wear a pair of leopard print bikini briefs to the pool. It seemed everyone was desperate to point out what they thought was so obvious: "only gay men and police officers wear moustaches." What a man’s sexual or legal proclivity has to do with his facial hair, I’ll never understand. And since I’ve never been one to let other people’s silly biases spoil my fun, I continued to use the razor sparingly. Over the years, I have had a variety of moustaches -- mostly variants of the pencil thin type. 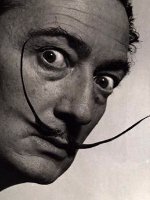 In recent years, more and more fashionistas have been spotted timidly alluding to the inevitable return of the moustache. Orlando Bloom wore one. Yes, even Johnny Depp appears from time to time moustached (I tell you, that guy’s always trying to bite my style!). Of course, both these men were involved in a Hollywood coup to bring back the long overdue pirate look. It's been over six months since my last post on Moustache Watch but take heart, that's, a short time, in moustache years (those of you brave enough to adorn your upper lip will discover that a moustache requires patience). When I last left you, I was going for length. As you can see from the photo above, I was still trying to keep the area above the mouth manicured -- perhaps in homage to my fondness for pencil thin staches, perhaps out of fear of completely embracing full-frontal fuzziness. As I continued to carefully trim the center into handsome Errol Flynn lines, I allowed the corners to grow spindley, coaxing them skyward with a healthy does of wax. While the overall effect was approaching Dali-esque, the practice led to some problems. Chiefly, I had done a sloppy job of trimming and was left with lopsided handles. To even out the problem, I decided to let nature take her course and I simply stopped trimming. The result was a regular soup strainer. For a few weeks, I found myself constantly having to wipe hairs away from my mouth. (This made for messy eating and a unusually messy kisses). However, I discovered that once the center area became long enough to incorporate into the edges, the extra length from the center increased overall moustache mass, giving the handles more heft while at the same time, eradicating the fuzzy mouth problem. 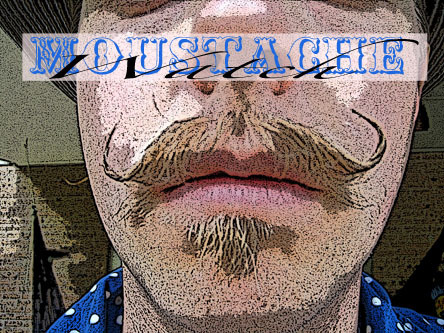 It also started to look more like an authentic handlebar, or western moustache. The moustache on 6-26-5. This is an awkward phase. 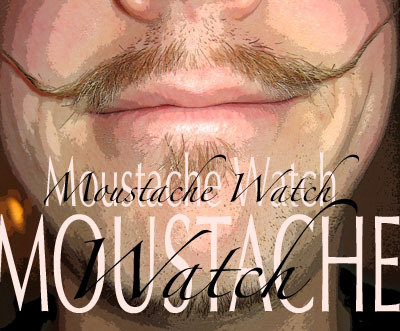 The area over the mouth has been allowed to grow long in order to cath up with the handles, giving more mass to the moustache. The areas past the corners of the mouth on each side have also been allowed to start filling in. Overall, a more general swooping, full effect, but messy eating. Following the links from there, I discovered a wide array of sites, clubs, and organizations dedicated to the cultivation of facial hair. I was so inspired, I decided to start my own club. That very same day, I ran into my first two members. Stay tuned for that story and more. In the meanwhile, have a look at the club logo, below. Click here to go to The HMBGS home page. This is a shot of the unstyled moustache. 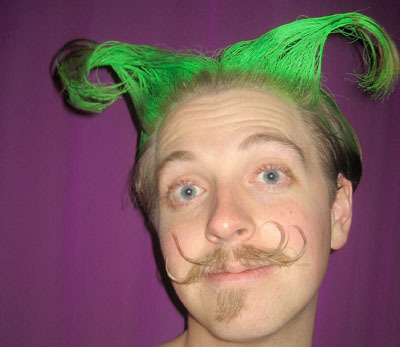 The trick to a really big moustache is lots of hair. As you can see, the area over the mouth is no longer tripped, allowing the center pieces to incorporate into the handles. Nobody can see the great Oz! Not nobody, not nohow! For Halloween this year, my girfriend and I attended Cabaret Diosa's "Somewhere Over the Mambo" at the Boulder Theatre. I was a resident of Oz. She was a munchkin. Notice the flamboyant double handle-bar?